If you listened to episode 180 of The Big Web Show , you heard two key themes: 1) personalization is now woven into much of the fabric of our digital technology, and 2) designers need to be much more involved in its creation and deployment. In my previous article we took a broad look at the first topic: the practice of harvesting user data to personalize web content, including the rewards (this website gets me!) and risks (creepy!). In this piece, we will take a more detailed look at the UX practitioner’s emerging role in personalization design: from influencing technology selection, to data modeling, to page-level implementation. And it’s high time we did. Just as UX people took up the torch around content strategy years ago, there is a watershed moment quickly approaching for personalization strategy. Simply put, the technology in this space is far outpacing the design practice. For example, while “personalized” emails have been around forever (“Dear COOLIN, …”), it’s now estimated that some 45% of organizations [PDF] have attempted to personalize their homepage. If that scares you, it should: the same report indicated that fewer than a third think it’s actually working. While good old “mail merge” personalization has been around forever, more organizations are now personalizing their website content. Source: Researchscape International survey of 300 marketing professionals from five countries, conducted February 22 to March 28, 2018. As Jeff MacIntyre points out, “personalization failures are typically design failures.” Indeed, many personalization programs are still driven primarily out of marketing and IT departments, a holdover from the legacy of the inbound, “creepy” targeted ad. Fixing that model will require the same paradigm shift we’ve used to tackle other challenges in our field: intentionally moving design “upstream,” in this case to technology selection, data collection, and page-level implementation. and monitoring customer feedback to make sure people aren’t freaking the f* out. When clients or internal stakeholders come to you with a desire to “do personalization,” the first thing to ask is what does that mean. As you’ve likely noticed, the technology landscape has now matured to the point where you can “personalize” a digital experience based on just about anything, from basic geolocation to complex machine learning algorithms. What’s more, such features are increasingly baked into your own CMS or readily available from third-party plugins (see chart below). So defining what personalization is—and isn’t—is a critical first step. Personalizing based on the physical location of the user, via a geolocation-enabled device or a web browser IP address (which can triangulate your position based on nearby wifi devices). Examples: If I’m in Washington, DC, show me promotions for DC. If I’m in Paris, show me promotions for Paris, in French. A simple, cost-effective way to gather first-party user data by asking basic questions to help assign someone to a segment. Often done as a layover “intercept” when the user arrives, which can then be modified based on a cookied profile. Generally must be exceptionally brief to be effective. Examples: Are you interested in our service for home use or business use? Are you in the market to buy or sell a house? 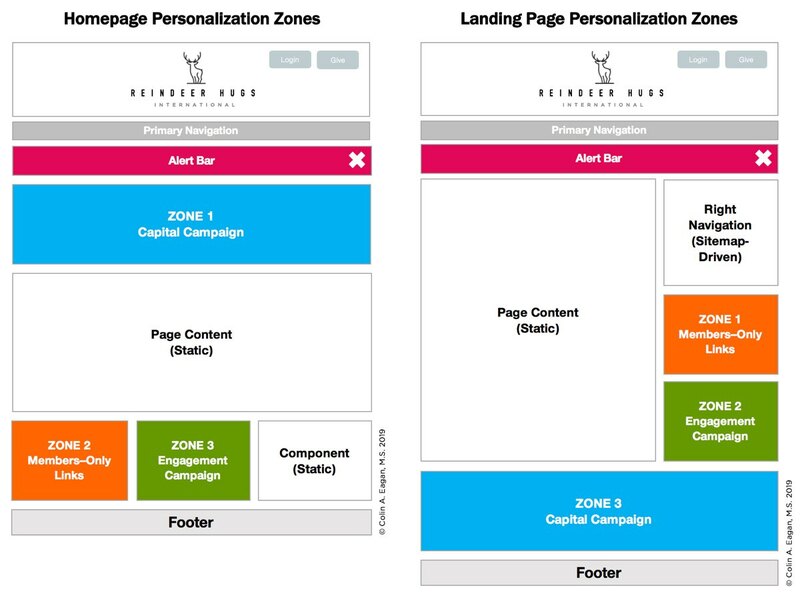 One of the most popular methods of personalization, it directs a user to a customized landing page based on incoming campaign data. Can be used for everything from passing a unique discount code to personalizing content on the entire site. Examples: Customize landing page based on incoming email campaigns, social media campaigns, and paid search campaigns. 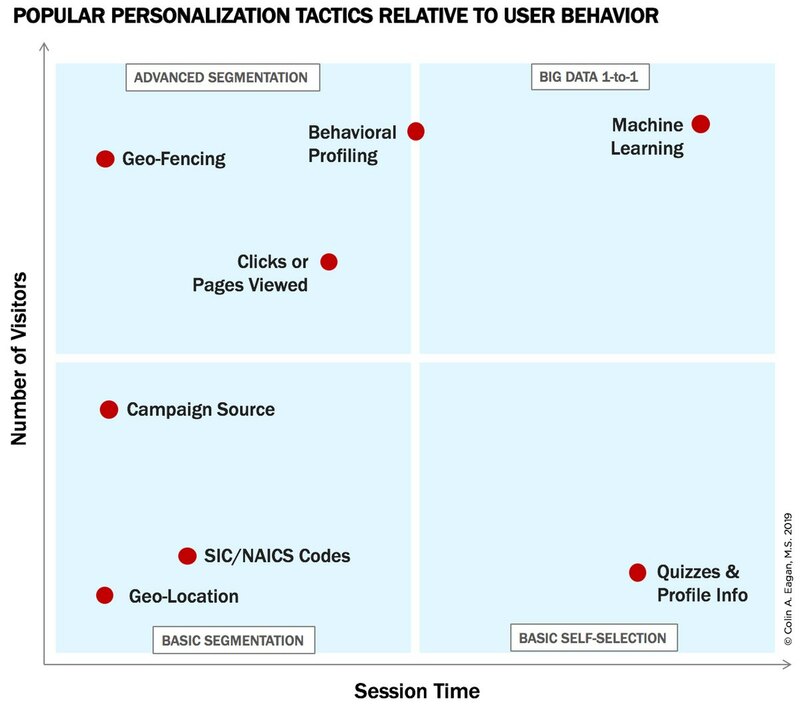 Slightly more advanced approach to personalizing based on behavior; common on ecommerce. Examples: Products you previously viewed; suggested content you’ve recently been looking at. Standard Industrial Classification (SIC) and North American Industry Classification System (NAICS) for classifying industries based on a universal four-digit code, e.g., Manufacturing 2000–3999. Helpful for determining who is visiting you from a business location, based on incoming IP address. Examples: Show me a different message if I work in the fashion industry vs. hog farming. Contextual personalization within a “virtual perimeter.” Establishes a fixed geographical boundary based on your device location, typically through RFID or GPS. Your device can then take an action when you enter or leave the location. Examples: Show me my boarding pass when I’m at the airport. Remind me about unused gift cards when I enter the store. Sample Tools: Simpli.fi, Thinknear, Google Geofencing API. Add a user to a segment based on similar users who fall into that segment. Often combined with machine learning to identify new segments that humans wouldn’t be able to predict. Examples: Sitecore pattern cards, e.g., impulse purchaser, buys in bulk, bargain hunter; expedites shipping. Identify patterns across large sets of data (often across channels) to better predict what a user will want. In theory, improves over time as algorithms “learn” from thousands of interactions. (Obvious downside: your site will need to support thousands of interactions.) Examples: Azure Machine Learning Studio, BloomReach (Hippo), Sitecore (xConnect, Cortex), Adobe Sensei. 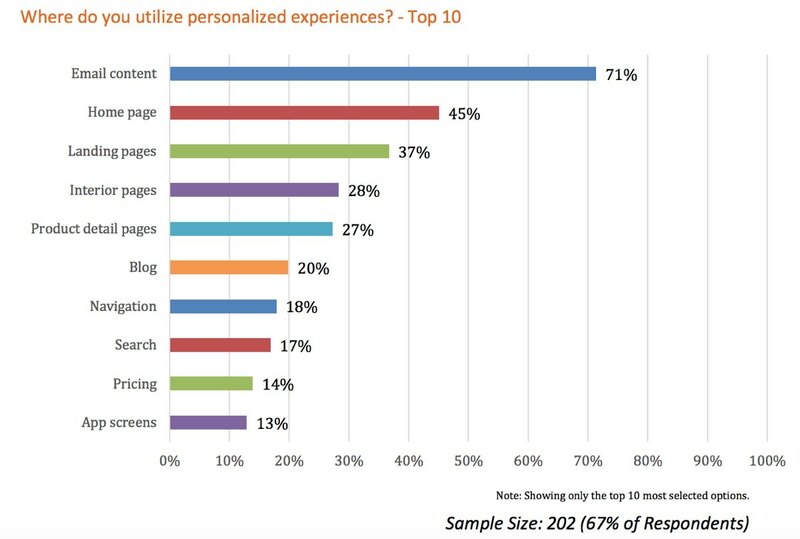 To find your personalization “sweet spot,” consider your audience in terms of volume (number of visits) and average attention span (time on site). Once you have a sense of the technical possibilities, it’s time to determine how the personalized experience will look. Let’s pretend we’re designing for a venture several of you inquired about in my previous article: Reindeer Hugs International. As the name implies, this is a nonprofit that provides hugs to reindeer. RHI recently set new business goals and wants to personalize the website to help achieve them. Logged in or made guest contribution (track via cookie) Improve engagement with current members by 10% You’re a hugging rock star, but you can hug it out even more. Inbound Facebook and Instagram campaigns Improve conversion with non-member males age 25–34 by 5% Make reindeer hugging manly again. Inbound Facebook and Instagram campaigns Improve conversion with non-member parents age 31–49 by 5% Reindeer hugging is great for the kids. 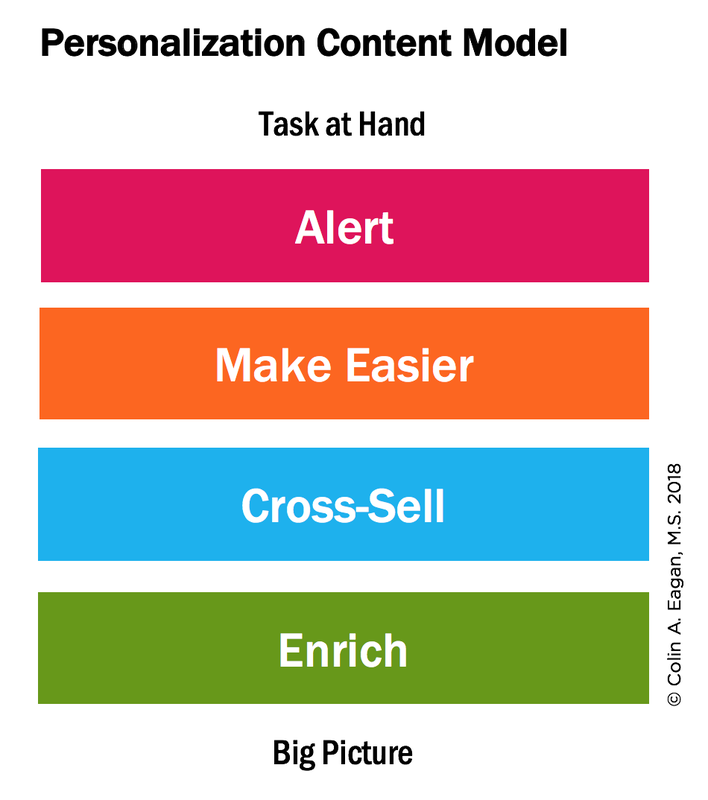 A Personalization Content Model showing four flavors of personalized content. Invest in creating original, hug-provoking content to further our brand. Demonstrate that we are the definitive source for reindeer hugs. Showing component-level “zoning” on homepage and landing page templates. The colors correspond to the personalization content type. Copy: You’re a hugging expert. But did you know you could hug two reindeers at once? Copy: Are you a real man? Parents with Young Kids Headline: Looking for a fun activity to do with the kids? Copy: Reindeer hugs are 100% kid-friendly and 200% environmentally-friendly. 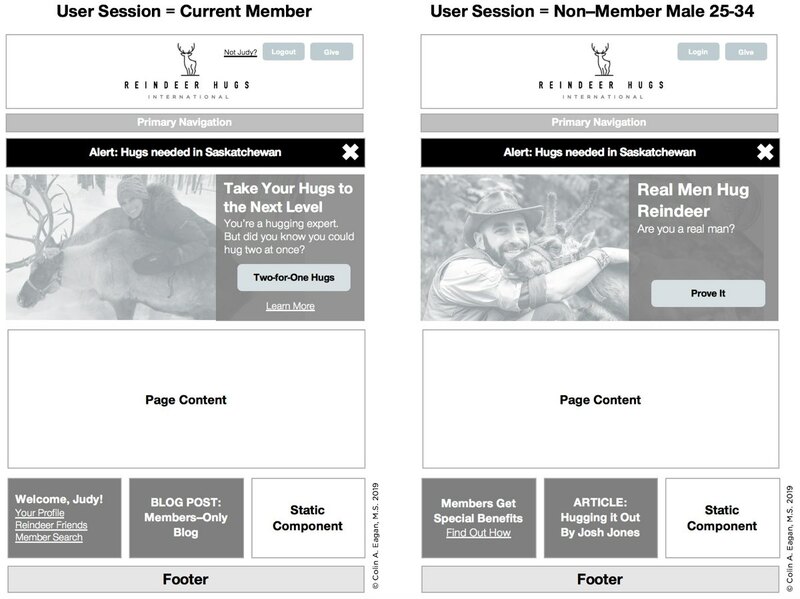 Wireframes illustrating the anticipated homepage delivery to two distinct audiences: Current Member (left) and Non-Member Male 25–34 (right). If the system did not get an audience match, a default or non-personalized set of content would be shown. The diagram at left shows how a particular user scores (some combination of research and returns merchandise). This most closely correlates to the “Neurotic Shopper” card, so we might show this user content on our free-returns policy. Source: The Berndt Group. While all of that is super cool, even the most tech-savvy among us will benefit from starting out “simple,” lest you fall prey to the cult of the complex. The manual process of identifying your target audience and use cases, for example, is foundational to building an extensible personalization program, regardless of your tech stack. At a minimum, this approach will help you get buy-in from your team and organization vs. just telling everyone the site will be personalized in a “black box” somewhere. And even with the best-in-class products, I have yet to find seamless “one-click” personalization, where the system somehow magically does everything from finding audiences to pumping out content, all in real time. We’ll get there one day, perhaps. But, in the meantime, it’s up to you. Experience management systems are making it easier than ever to customize content for your visitors—but are you using your newfound personalizing powers for good (or for creepy)? Colin Eagan shows that personalization can be done, thoughtfully, using the same tools you would apply to any content strategy conundrum: by asking why, being deliberate, and putting users first. Colin Eagan is user experience manager at ICF Interactive in Washington, DC, where he works to create content strategies and other useful digital things for Fortune 500 companies, nonprofits, and government clients. He is a frequent contributor to UX blogs and conferences, including Gilbane, Ad Age, and The UX Booth. He credits any career success thus far to his decision not to go to law school. Really great article – thanks for making it easy to understand. Thanks @KevinPNichols for the great feedback. I’m glad you picked up on the copy deck — i’m sure you have much better examples than I do! I like the concept of positioning content leading to larger articles and ideally capturing in a CMS. Taxonomy / metadata is a huge other issue that this article really didn’t get into. @GuyCooper: thanks for mentioning the Google Maps ‘for you’ feature specifically: the approach is a good example of blending push and pull personalization (e.g. geo-location vs. manually updated areas/interests). Obviously predictive search could also be another addition to the chart (although that begins to verge into other territory). I really like your Wave Digital logo.